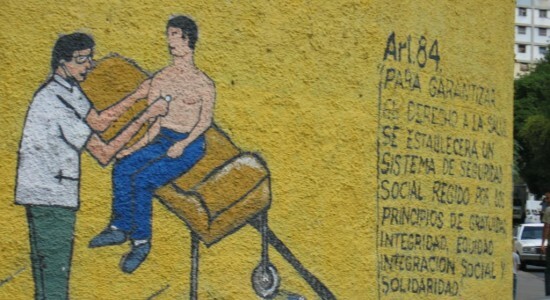 A review of Vital Politics: Medicine and Citizenship in Venezuela, by Amy Ellen Cooper. Civic participation in the administration of public healthcare in contemporary Venezuela is an opportunity to enact citizenship and negotiate and contest the government’s provision of services. As Amy Cooper explains, the participation of Venezuelans in the country’s newly public medical institutions represents not only a change in how individuals perceive health, but also in how citizenship in Venezuela has become “medically mediated” (p. 6). In her dissertation, Cooper reexamines anthropological understanding of “medical citizenship” to explain new meanings of health and health practices in relation to political subjectivities and citizenship among residents of a working class neighborhood in Caracas’ historic district. By focusing on “patienthood” and the people’s involvement in the state welfare system known as Misión Barrio Adentro, Cooper deconstructs the complex features that characterize medico-political affairs in contemporary Venezuela. This dissertation investigates how seeking better health is about more than just curing a “broken body but about a new sense of agency over one’s body and health and de-marginalizing oneself physically, socially and politically” (p. 116). In the introduction, Cooper frames Misión Barrio Adentro in a global perspective, comparing it to socialist health programs in China and Cuba. She also discusses the relationship between medicine and politics based on analytical dichotomies, such as inclusion/exclusion (represented in the work of Nancy Scheper-Hughes, Lynn Morgan, Marilyn Nations and Linda Rebhun, Jim Yong Kim, Julia Paley, Paul Farmer, Arachu Castro and Merrill Singer, Charles Briggs and Clara Mantini-Briggs, João Biehl, Catherine Maternowska, Sandy Smith-Nonini, and Alex Nading) and equality/inequality (as theorized by Marcos Cueto, Anne-Emmanuelle Birn and Armando Solórzano, Melinda Meade, Asa Critina Laurell, David Sowell, Howard Waitzkin et al., Francisco Armada et al., Diego Armus, Jaime Breilh, Steven Palmer, and Ann Zulawski). Cooper expands these previous analyses by drawing on the meaning of biopower (Michel Foucault, Mitchell Dean, Jonathan Xavier Inda, Nikolas Rose and Peter Miller) and citizenship (Sonia Alvarez et al., Evelina Dagnino, Susan Eckstein and Timothy Wickham-Crowley, Camille Goirand, Patricia Richards, Deborah Yashar, Nancy Grey Postero, Joseph Tulchin and Meg Ruthenberg, Sian Lazar, James Holston, and Richard Stahler-Sholk et al.). Along with previous studies about medical or biological citizenship (Foucault, Dean, Inda, Rose and Miller, Paul Rabinow, Karen-Sue Taussig), Amy Cooper agrees that “contemporary forms of citizenship are becoming more dependent on biological and medical factors” (p. 24), but in her analysis she finds that Venezuelans engaged in state-supported medical programs experience a more positive relationship with the state and are participants in new forms of political activism through the promotion of health. This study shows “how transformations of political subjectivity and agency through healthcare are connected to larger social and political relations and practices” (p. 25). In Chapter 1, Cooper explores how the experience of health and citizenship in Venezuela has been historically shaped by themes of Catholicism, positivism, neoliberalism, and the oil economy. For instance, Cooper finds that the strong Catholic tradition inherited during the colonial period, combined with the ideology of positivism adopted between the late 1800s and early 1900s, served to validate health care as a social right and a state responsibility. Cooper analyzes how the oil boom supported those ideas until the imposition of neoliberal ideologies and practices, at which time “social services diminished in quantity and quality, and social inequalities, poverty, and violent crime all rose sharply,” (p. 52) creating the conditions for Chavez’s immense popularity in 1998. Health practices are generally related to healing bodies, but Cooper explains that in Venezuela, those practices have become a “political experience of citizenship” (p. 73). In chapter 2, relying on extensive and eloquent ethnographic data, Cooper interprets the medical interactions between individual patients and state institutions to reveal the nuances that characterize public medicine. Cooper critically observes that, even though most of her informants agree that the current opportunities to receive medical care from the state are greater than before, Venezuelan public medicine is still a “fractured and incomplete system” (p. 90). As a result, not everyone is fully engaged in using public health services, and some continue to seek a variety of alternatives, which include a wide range of spiritual and popular empirical healing practices. Surprisingly perhaps, those “spiritual and empirical” alternatives do not clash with Barrio Adentro and other public health programs, but overlap with them and are actively promoted by state officials (p. 116). Cooper explains how the Chávez government has incorporated healthcare into the body of the constitution, encouraging Venezuelans to regard health not only in its biomedical sense, but as a basic human right that is “guaranteed by the state and is the responsibility of individual citizens” (p. 102). In Chapter 3, Cooper deepens her analysis of how citizenship is articulated through medical practices and shows that health is not only “the absence of disease, but rather a ‘bio-psychosocial’ phenomenon” (p. 138) that creates a “political subjectivity for patients” (p. 126). Drawing on previous research on doctor-patient interactions in other biomedical settings, she finds some analogies but also important differences. For instance, Cooper advises that the Foucauldian theory of the medical “gaze” is not applicable to every context, such as with Barrio Adentro, where face-to-face interaction is a sign of “mutual respect and egalitarianism” (p. 138) between doctor and patient. Cooper also finds parallels between Wendland’s (2010) Malawi analysis with Barrio Adentro, however she notes that Venezuelans doctors – in contrast to their Malawian peers – emphasize care and compassion in public health not because it is the single resource they can offer due to limited resources, but as an additional principle to technical competence (pp. 147-8). Cooper interprets a series of bodily, communicative, and spatiotemporal practices that characterize Barrio Adentro, and concludes that they not only advocate a relationship of “political solidarity” between “doctors and patients,” but also between the “state and citizens” (p. 149). Consequently, medical encounters become social and political vehicles for patients (p. 151). Participation in the healthcare system is not limited to doctors and patients; it also includes an extraordinary number of community health volunteers. Complementing her previous chapters, Cooper analyzes the volunteers’ experiences of providing healthcare for others. One important feature that she highlights is that most volunteers are women, a phenomenon found in many other studies as well; however in her sample, these women are not only active participants but also local leaders engaged in the solution of local problems. In Chapter 5, Cooper concludes that opportunities for volunteer participation through different social program have become a “powerful form of belonging in a new socio-political order,” (p. 173) and an excellent example of “vital politics,” a term that Cooper develops in her conclusion. In Chapters 5 and 6, Cooper focuses her attention on two additional groups: abuelos and indingentes [grandparents and homeless]. While “Grandparents Clubs” are a positive initiative that “reposition marginalized people in the new political order,” (p. 222), the success of Misión Negra Hipolita seems to be limited by the state’s vision of social welfare. Cooper’s ethnography recounts not only the positive aspects of the healthcare program, but also its failures. The Negra Hipólita mission “sought to transform both the public perception and the lives of los indigentes through targeted interventions and community participation,” (p. 232) however, los indigentes have become a threat to a healthcare model unable to fully include them. Cooper ends her ethnography with the concepts that inspired the title of her dissertation: “Vital Politics.” As she concludes, in contemporary Venezuela “politics has come to be indispensable to life in a literal sense as well as […] with saving lives” (p. 260). Just six months after the completion of Cooper’s dissertation, Venezuelans mourn the death of President Chavez and are preparing for a new presidential election. At every level of society, people ponder the future of a post-Chavez Venezuela. Cooper’s dissertation is an important contribution to the process of understanding the future changes in the fields of biomedicine, healthcare, and social programs in Venezuela. Ethnographic research in Caracas, Venezuela. University of Chicago. 2012. 299 pp. Primary Advisor: Jennifer Cole and Judith Farquhar. Image: Photograph by Amy Ellen Cooper.